Landscaped areas that have flowers, shrubs or even edible plants, benefit greatly from mulch, which is any substance that can be spread over the soil as a covering. Mulch might be organic (wood chips, pine straw, lawn clippings or shredded leaves), inorganic (crushed lava rock or small stones) or a combination of materials. Not only will mulch significantly decrease the need for weeding, it also allows the soil to retain moisture and remain cooler on hot days, which will help plants thrive. When expanding your landscaping, aim for plants that aren’t fussy when it comes to maintenance. For example, think flowering bushes instead of roses. Larger plants, like shrubs, can help create visual interest and also prevent some erosion, especially along hillsides. And if you choose slow-growing options, like Dwarf Globe Blue Spruce or varieties of laurel, you won’t spend much time cutting them back. Take a cue from nature and allow untamed areas, particularly patches filled with wildflowers, to flourish. By planting native grasses and spreading some flower seeds, you can create a haven for pollinators, like butterflies and honeybees, while ensuring that you don’t have to do much to keep it looking great. Rounded rock pathways or raised borders might be pretty, but when it comes to mowing around them, it can feel like a chore to go back with a weed whip or an edger. Flat walkways — like flagstones or wood planks embedded at or slightly below lawn level — that you can mow over might not be as manicured in appearance, but they can be attractive, functional and easier to care for. Using native grasses and mulch can go a long way toward reducing your need for watering, but for plants that need a hydration boost, consider a system that lets you turn on an outdoor faucet for an hour or two and then turn it off when the ground is saturated. This might be as simple as drip tape laid out along the base of your beds. If you invest in an automatic in-ground sprinkler system, be sure to choose a smart one that doesn’t just operate on a timer, but can sense that the soil is moist enough, like during a rain shower. This will conserve water and save you money. 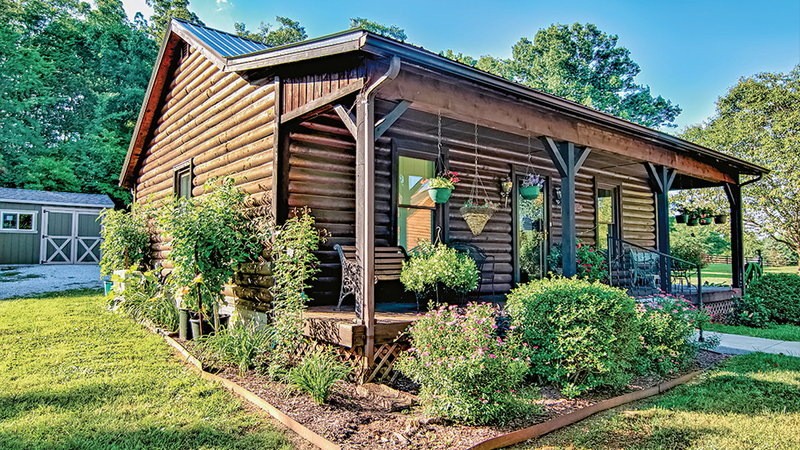 Simple, affordable strategies that are focused on making your property more self-sufficient means you’ll spend far less time taking care of your log home’s landscape, giving you far more time to enjoy it.